This is part of our Lava Lake series. Brian and Kathleen Bean’s family-owned ranch is located just southeast of Sun Valley where the Pioneer Mountains meet the Snake River Plain. They own 24,000 acres and control 900,000 acres of grazing allotment lands. Posts continue Tues/Thurs through October 2011. 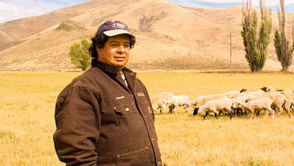 Some of their Peruvian herders, hired through the Western Range Association, have been working for Lava Lake and its predecessor ranches for more than 20 years. Every three years, the herders return to their communities in Lima or in rural villages at elevations as high as 14,000 feet. Everyone at Lava Lake believes that it’s their responsibility to leave the landscape in better condition than they found it. “We care about sage grouse and sagebrush too,” Brian says, “We do a lot specifically to benefit them. We put an easement over 2000 acres of prime habitat with assistance from the Farm and Ranchland Protection Program of the Natural Resources Conservation Service (NRCS) as part of their Sage Grouse Initiative. In our ten years of ownership, we’ve seen sage grouse here every year. The roughly 500,000-acre region that connects the Pioneer Mountains to the deserts of the Snake River Plain includes about 100,000 acres of private land, much of it sizable ranches. Lava Lake’s neighbor, the historic Flat Top Ranch, has also done a series of easements. A landscape which had zero acres of protected private land 10 years ago, now boasts well over 20,000 acres permanently protected. Return next week to learn how Lava Lakes Ranch is co-existing with wolves. The duty of all staff at Lava Lakes Ranch is to leave the landscape in better condition than they found it. 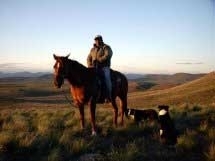 The many ways that ranchers in Idaho are contributing to the conservation of a great American landscape. •	Real names are required, including first and last name. •	Please be civil in addressing and referencing other LandCAN comments and stay focused on the subject at hand. •	Objectionable content is forbidden. •	LandCAN reserves the right to remove any comment for any reason. 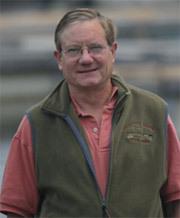 Amos Eno is the president of the Land Conservation Assistance Network. This blog will help you understand why we do what we do and inform you of the current happenings in our focus area. Read more about Amos S. Eno. Amos S. Eno has worked in conservation for over 38 years on international, national and state levels. He began his career early in the 70’s working for Nat Reed in the Office of the Secretary of Interior. Subsequently he worked in the Office of Endangered Species, USFWS, and as head of National Audubon Society’s wildlife office in Washington, DC. He developed the programs of the National Fish and Wildlife Foundation from inception and served as Executive Director for 11 years. While with the New England Forestry Foundation he led the team completing the 2 largest forestry conservation easements in the U.S. totaling 1.1 million acres. He has travelled around the world, and spent three years in Africa which provided seminal instruction on the importance of private lands as the key to 21st century conservation strategies. ©2017 Land Conservation Assistance Network. All rights reserved.